We spent our “free” day in the villages around Lake Atitlan – Central Americas largest volcanic lake. We toured a chocolate factory and visited with several different women’s co-ops. Learning how they make textile fabrics, and how regional medicinal herbs are used. 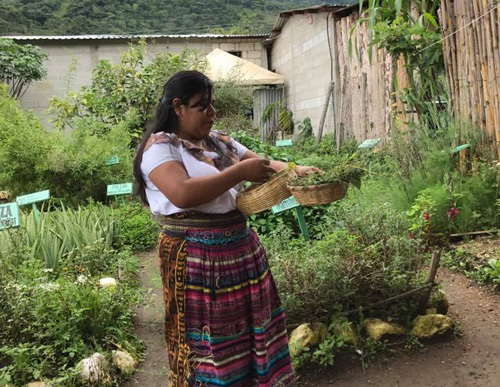 One of our team even found some relief from a cold and cough with herbs from a Mayan midwife. Weaving a scarf likes the ones behind her every single color in that yarn comes from a natural material or a plant. The cotton is handpicked and is a long process from cotton to a garment, scarves, purses and toys. All of those colors of yarn are made using local natural plant materials. Today is the celebration of Corpus Christi. This “carpet” is hand made using pine needles, sawdust using natural dyes and local plants and flowers. It can take hours to creat and minutes to destroy when the celebratory parade comes through.